Fish tacos are an easy and delicious dinner idea, this fish taco recipe is a great addition to your dinner meal plan! Fish tacos are one of my very favorite meals. 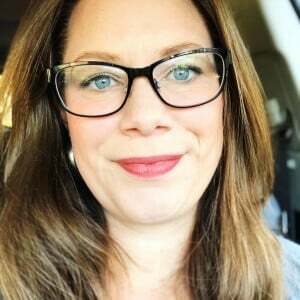 I first discovered fish tacos on an impromptu trip to the beach, and have since had my very favorite ever fresh fish tacos on a visit to Costa Maya Mexico – they literally caught the fish while we were sitting there! 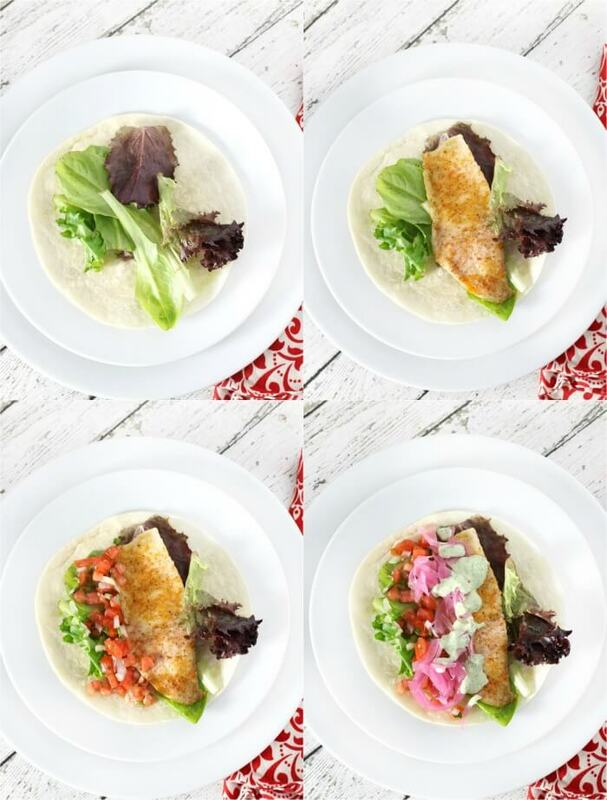 Since then I’ve been making this delicious fish taco recipe at home and it’s a huge hit with the whole family. We like to serve it with cauliflower rice or black bean soup! Tilapia – We like tilapia for fish tacos because it’s a light flavored fish and inexpensive. If you prefer not to use tilapia, grouper is a delicious alternative. Olive oil – Just a drizzle for baking the fish, I love a more robust olive oil but whatever you have on hand will work just fine. Seasoned salt – In the absence of seasoned salt, you could use just salt and pepper or garlic salt. Lettuce – I like to use a spring mix or baby spinach leaves. Fresh salsa – This pico de gallo recipe is perfect on fish tacos. Red onion – I’m partial to pickled red onions on my fish tacos, but thinly sliced plain red onions are good too. Cilantro garlic sauce – If you’re anti cilantro then go for the good old sour cream, but if you like cilantro, you’ll absolutely love this cilantro garlic sauce. 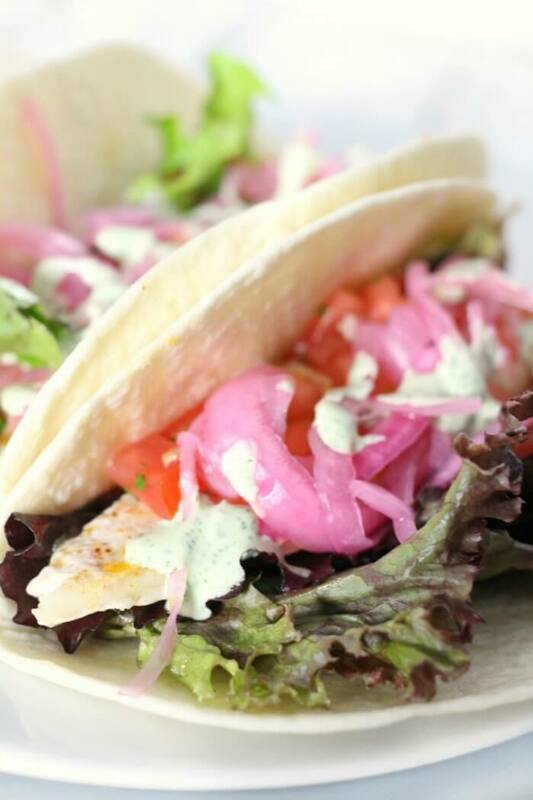 Tilapia is the best fish for fish tacos because it’s light flavor, moist and flaky, and is reasonably priced. Alternatively grouper is delicious and whitefish works as well. 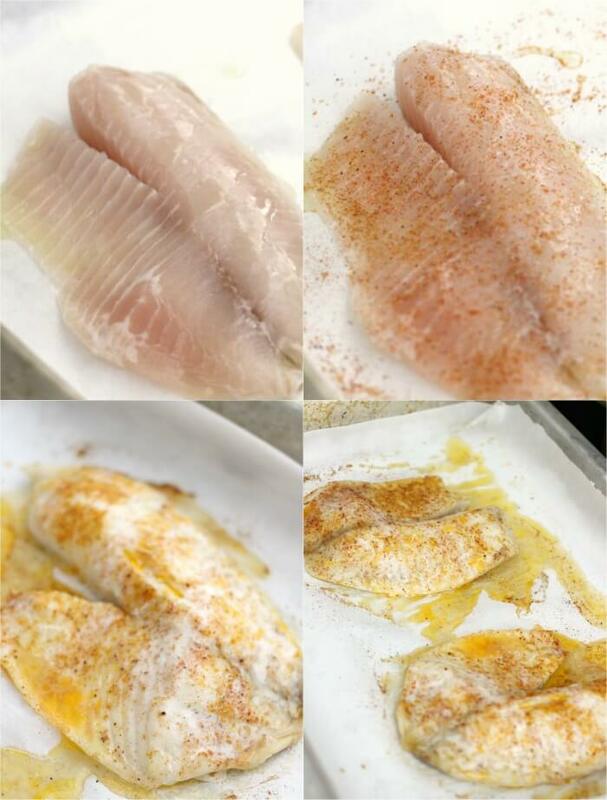 We like to bake the tilapia on a sheet pan with a little bit of olive oil and seasoned salt. The filets are small so they cook up quickly and fit perfectly into tacos. What toppings do you put on a fish taco? 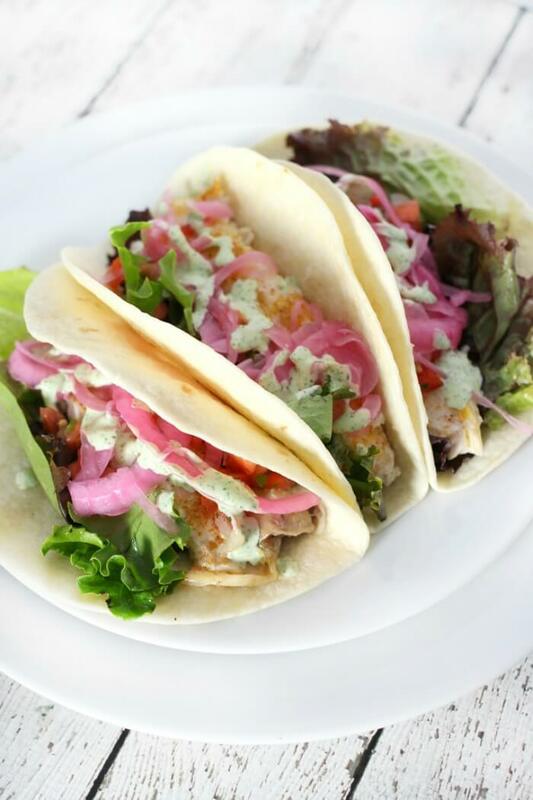 The best toppings for fish tacos are pico de gallo, lettuce, pickled red onions, and cilantro garlic sauce. If you don’t have pico, fresh diced tomatoes are great. Thinly sliced red onion works if you don’t have time to pickle yours, and if you’re not a fan of cilantro try a dollop of sour cream. How many calories are in fish tacos? 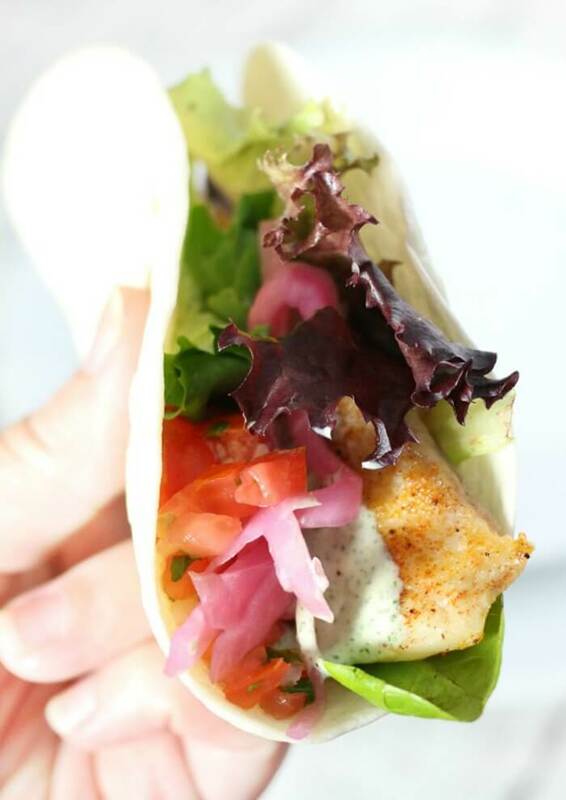 Fish tacos made with tilapia are about 230 calories. Because it’s hard to know what toppings will be added to the fish tacos, this calorie calculation is for the flour tortilla and one tilapia filet. Toppings like lettuce, onion, and salsa won’t add almost any calories, but sour cream or cilantro garlic sauce will change the number. What spices to use for fish tacos? I like to use a mild seasoned salt for the spices on our fish tacos, or sometimes even just salt and pepper. If you’re looking for a more bold flavor though, chipotle seasoning or blackened seasoning would work well. Great side dish ideas for fish tacos are guacamole, black bean soup, and roasted plantains. I also love white rice or cauliflower rice as a side! Honestly though, the tacos themselves have everything to make a complete healthy meal, so don’t feel guilty for skipping the sides if you want! You can also watch us make these fish tacos on YouTube! Make sure to tune in for all our live cooking shows! Layer ingredients onto the flour tortilla as follows: lettuce, tilapia, pico de gallo, pickled onions (be generous), and cilantro garlic sauce (be very generous). **Calories are calculated for flour tortilla and one tilapia filet. I am an official fish taco addict and these look fabulous! That Cilantro Garlic sauce? So making this for my next batch of tacos!!! Fish tacos are my husband’s favorite! These are so great! Perfect for summer.